Access to this Protected Area is from the Copper River Forest Service Road. Drive with caution. There may be rocks or wildlife on the road and other industrial traffic such as logging trucks, heavy machinery, or other vehicles. 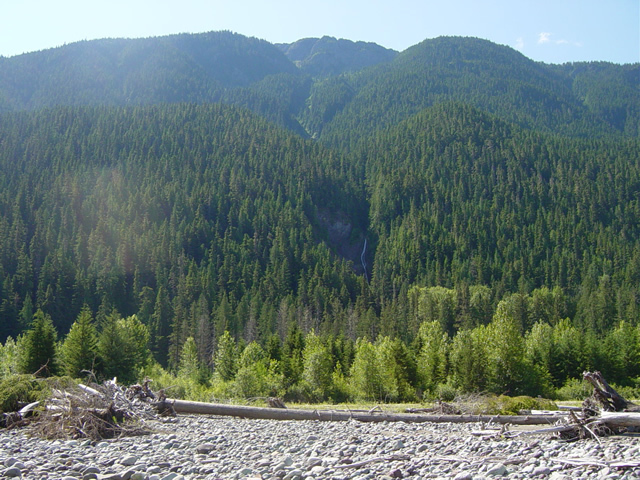 Swan Creek Protected Area (PA) was designated on March 22, 2005 as recommended through the Kalum Land and Resource Management Plan. It protects a small, steep, unlogged watershed in the Nass Mountain Range Ecosection. The small watershed provides a viewscape to anglers on the Zymoetz (Copper) River, with a waterfall that flows into “Swan Creek”. The area protects old-growth trees such as Western Hemlock, Mountain Hemlock, Western Red Cedar, and Subalpine Fir. It also provides habitat for furbearers and waterfowl. There are no facilities, trails, or designated campsites in this Protected Area at this time. There is a waterfall in the middle of the Protected Area that can be seen from the road or from the Copper River. Swan Creek Protected Area is located near Terrace. It is situated on the south side of the Zymoetz (Copper) River and also on the south side of the Copper River Forest Service Road (approx. between 30 and 31 Km). The east side of the Protected Area is across from the confluence of Salmon Run Creek and the Zymoetz River. Swan Creek PA is accessed by the Copper River Forest Service Road, which begins off the east side of Highway 16, approximately 7 kms east of Terrace. The forest service road runs along the south side of the Copper River. The Protected Area is located approx. between the 30 and 31 Km markers along the south side of the Copper River Forest Service Road. The 1:50,000 scale topographic map for this area is mapsheet number 103 I/8 (Chist Creek). History: This protected area (PA) was recommended for protection as a result of the Kalum Land and Resource Management Plan. The role of Swan Creek PA is to protect a small, steep, unlogged watershed with a waterfall. The area provides a nice viewscape for anglers on the Zymoetz (Copper) River. Cultural Heritage: Swan Creek PA is within the traditional territory of the Kitselas Band of the Allied Tsimshian Tribes. The cultural features of the area have not been identified to BC Parks. There are no registered archeological sites in the PA and no Indian Reserves within a 5 km radius. Conservation: Swan Creek PA protects a small area of old-growth forest. Areas on either side of the PA have been logged. The streams beside the Copper River Forest Service Road may contain fish and provide waterfowl habitat. There are no registerd occurrences of Provincially red- or blue-listed species or plant communites in Swan Creek. However, adequate inventory data is lacking. Wildlife: Beavers, river otters, moose and waterfowl can be present in the waterway on the south side of the Copper River Forest Service Road. Good fishing opportunities for salmon and steelhead in the adjacent Zymoetz (Copper) River to the north of Swan Creek. Anyone fishing or angling in British Columbia must have an appropriate licence. The park is open to hunting. Please refer to the British Columbia Hunting Regulations for more information. Horses are not allowed in the Protected Area. BC Residents do not need a Park Use Permit to hunt in Swan Creek PA. Please Conserve Firewood – While campfires are allowed, we encourage visitors to conserve wood and protect the environment by minimizing the use of campfires and using camp stoves instead. Limited burning hours or campfire bans may be implemented. No firewood available. Wilderness, backcountry or walk-in camping is allowed, but no facilities are provided. At this time there are no trails, facilities or designated campsites in Swan Creek Protected Area. However, the Salmon Run Forest Recreation Site is located across from the PA, on the north side of the Copper River Forest Service Road at about the 30 km marker. The Salmon Run site has 3 campsites, picnic tables, fire rings and a pit toilet.